I’m a Thai food snob! I’ve been to Thailand many many times, I lived with a Thai boyfriend decades ago and it was he who taught me how to cook most of the Thai dishes I make at home these days. It has been a really daunting task living here trying to find a Thai restaurant which lives up to what my palate is used to and so, I end up rarely eating Thai outside of home. One of my favorite places for Thai is Siam Taste of Asia in Santa Ana, but recently I found another one, closer to home, in Tustin. Sutha is a little hole-in-the-wall so hidden you will most likely miss it all together if you didn’t know to look for it. Since then I’ve visited on several times and have brought friends with me. My usual thing to order is the yum neur (Thai beef salad) and I fell in love with it as soon as I put the first morsel of it into my mouth. The dressing was perfect — right amount of saltiness mixed with the right amount of tartness. I was in heaven! I would come here just to eat this dish alone, but of course, the glutton in me ordered other stuff as well. The green chicken curry was also a cut above what I’ve tasted in other Thai establishments in Orange County! It’s not overly sweet and the sauce is not watery like a lot of restaurants tend to serve. I make this at home often but it’s nice to to have to do it because I can’t find a good one in a restaurant. Nam sod is another dish I love and few restaurants do it right. The version here doesn’t have ginger, but the ground pork and crispy rice salad is delicious and I love the varying flavors and textures you get from each bite — the salty, tart, crispy, chewy. Pad kee mow is known as “drunken” noodles in Thailand and is a widely popular hangover dish which consists of thick flat rice noodles, a handful of vegetables and meat of your choice. Tofu is another option if you don’t want meat. 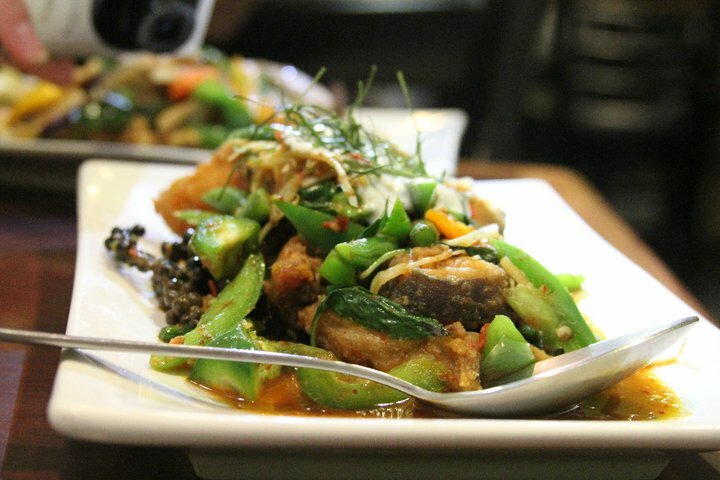 If you like catfish, the curry catfish is not to be missed. Chunks of catfish is fried and then topped with a fragrant curry sauce infused with kaffir lime leaves and black pepper corns. The restaurant is very small and seats about 20 people. Service is really good considering there is only one person manning the front of the house. The lovely Thai gentleman is courteous, friendly and just the sweetest man ever! >Have you tried "Sweetie Thai" in Cerritos? Really good Thai place. >Yes I have tried Sweetie Thai but it was a long time ago. I remember it was just okay then…. is it really good now? >So glad you reviewed them! I haven't lost my fondness for this place and I'm glad you haven't either. >Anita, it's one of my fav Thai restaurants in LA. Not sure how long ago you ate at Sweetie Thai, but I absolutely love the food, decor,and service there. If you do go, try their Papaya Salad. The curries and pad kee mow is really good too.Another Thai place I like is Bamboo Thai Bistro in Redondo Beach.